In North Dakota, winter is coming. This has been a reason to push for more funding for the 700-some protesters remaining at the Standing Rock Reservation near Cannon Ball, North Dakota. The group, which first gathered in April to protest the Dakota Access Pipeline, is increasing its calls for aid as the weather gets colder. The calls for supplies come even after the group has received millions of dollars of donations online, as well as donated supplies from a variety of groups. As the camp has grown in size, area residents have come to see the camp as a drain on local resources. Ranchers have complained that they have had cattle stolen and butchered, and one went on local radio to accuse the protesters of emptying the food banks in Mandan, N.D. from the people who really need the extra help. The protests and the camp are funded through private donations. The bulk of these are funneled through campaigns set up by the camp itself–with one aiming to raise money for a legal defense fund, and another solely dedicated to the camp’s operating costs. On FundRazr, the legal defense fund for the camp has raised some $518,000 out of its goal of $750,000. In regular updates to the fundraising site, the group stressed that additional funds were still needed to prepare for the coming cold and stressed that it was the only official Standing Rock gofundme campaign. This is true. However, a quick search of the site brings up dozens of other campaigns started by supporters of the movement in order to raise funds for supplies. If anything, the Dakota Access Pipeline protesters are flush, and have received substantial donations both directly and through several different crowdfunding sites. Since April, a series of more than 200 such online campaigns has raised more than $2 million on behalf of the Standing Rock Sioux Tribe and other groups fighting the pipeline project. And this total includes only the funds raised through the gofundme site. The camp also directs supports to give money directly through PayPal, which does not post totals of the donations received. Additionally, the camp asks for and receives gifts of supplies. In September, Greenpeace hosted supply drives for the camp in ten cities. The Los Angeles drive alone sent four carloads of supplies, including blankets, tents, and sleeping bags. A non-profit disaster relief organization known as the Rainbow Rapid Response Fund sent the camp a 12-burner stove it had previously sent to Hurricane Katrina disaster relief efforts. Although the camp pleads want, donors, including the North Dakota’s Homeland Security Division have complained that donated materials are wasted. DHS, which had provided the camp with trailers and water tanks, pulled the materials in late August after vandalism by protesters. Other groups found that donations come in excess and are ruined. NBC reported recently that the camp had been “inundated” with clothing donations, receiving so much clothing that some of it was ruined due to rot and wet without being used at all. Rather than a shortage of funds, the camp’s wants seem to stem, at least in part, from the extensive “earmarks” put on donated dollars. 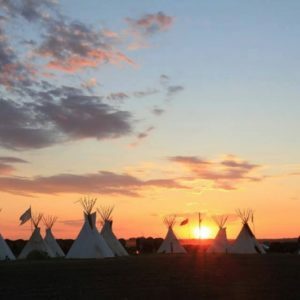 Rather than funding the camp’s general operation, campaign founders instead opted to specialize their requests, leading to such requests as raising $650 to send firewood to the camp, and $1,985 to send a team of acupuncturists from Brooklyn to Standing Rock. As the camp posts repeated pleas for more supplies, it appears to be sitting on a significant amount of cash that may leave many donors questioning the urgency of their funds.